Above: Veteran officers of the Columbia, South Carolina, PD, which has a long and proud history of meaningful community engagement. It was those relationships Chief Skip Holbrook (second from right) credits with keeping things calm during challenging times. In June of last year, a white man went into a black church in Charleston, South Carolina, and opened fire as people were attending a prayer meeting. Nine people were killed, including the pastor. The suspect, Dylann Roof, was arrested the following day. The horrific act of violence came at a time when people across the country were protesting a series of controversial police shootings. The police were preparing for the worst. Skip Holbrook has been the chief of the Columbia PD since 2014. He says his officers have gained a lot of experience in working mass demonstrations and maintaining peace among large groups of volatile protestors, particularly during the many protests that occurred after the governor ordered the Confederate flag removed from all state buildings. Columbia is the state’s capital. “During the protests over the Confederate flag issue, it got really tense,” Holbrook explained. “The Ku Klux Klan and the New Black Panthers held dueling rallies to voice their opposing views, along with others on hand representing every viewpoint in between. “It was a trying time for the Columbia Police Dept. the Richland County Sheriff’s Dept., and the South Carolina State Police. But together we were able to keep things calm.” Holbrook also noted that the balance officers must maintain between warrior and guardian was on full display during the protests. Police officers were present to act as guardians safeguarding the constitutional rights of the demonstrators. But when dealing with violent individuals who threatened the people’s safety, police officers were ready to employ warrior-like skills to protect anyone in harm’s way. The chief admits concerns existed following the tragic murders in Charleston that protests might turn violent. 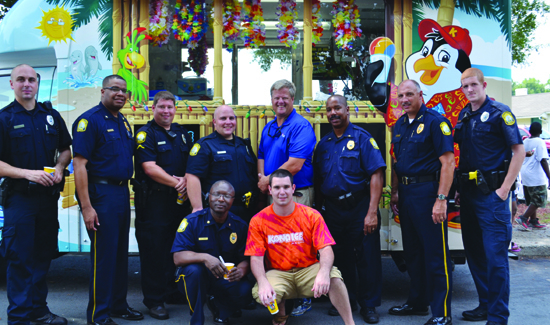 The Columbia Police Department, as well as other Midlands law enforcement agencies, have had a long and proud history of meaningful community engagement. It was those relationships, built up over many years with citizens, politicians, churches, community groups, activists and others, that the chief credits with keeping things calm during challenging times, in contrast to the violence that erupted in places like Baltimore and Ferguson. When the President’s Task Force 21st Century Policing issued its final report with a comprehensive list of changes agencies can make to rebuild relationships with the community, improve training, and create officer wellness programs, the Columbia PD embraced the recommendations with enthusiasm. “The recommendations outlined by the Task Force provide an opportunity, and serve as a blueprint, for agencies to be proactive in making positive police reforms before a controversial enforcement incident occurs,” Holbrook noted. “We found that we had already begun making some of the recommended reforms, but some we were not and some things we knew we could do better.” Holbrook also thought it would be helpful to formalize and put structure to his department’s efforts to implement the President’s Task Force recommendations. He said it was essential to provide city officials and community members with a gauge of where the police department currently stood in regard to the various proposals contained in the Task Force Report, and begin a collaborative assessment of recommendations to be addressed going forward. To accomplish this goal Chief Holbrook and his staff put together the “City of Columbia’s Implementation Plan—Moving from Recommendations to Action.” Internally, the police department maintains a chart tracking the status of implementation of each recommendation and actions taken. The recommendations and policies being adopted by the Columbia PD are extensive. First off, there is a renewed push for greater transparency and accountability. Public command staff meetings now take place at community facilities throughout Columbia on a bi-monthly basis so people can hear directly what’s going on. The Columbia PD, led by Chief Skip Holbrook, is rapidly becoming the leading model for agencies who want to make important changes on a variety of fronts. There’s a Citizens Police Academy, where people can see first hand the complexities of the work and the enormous amount of training that’s required to do the job well. A Citizens’ Advisory Council (CAC) was established in 2015 to work with the police department to help identify ways to improve community-police relations. Many of the Police Department’s annual reports are posted online, including an annual internal affairs report, a five-year strategic plan, and the agency’s year-end report. Columbia officers now provide “business cards” to individuals with whom they interact. The cards contain an officer’s name and badge number and provide a mechanism for citizens to share information about their interactions with officers. Suggestions in the report for better training are numerous and the Columbia PD is working on most of them. Officers learn about conflict resolution and de-escalation tactics and both classroom instruction and role-playing exercises are designed to strengthen negotiations skills. “Our community is extremely diverse,” Holbrook says. “Forty-five percent of the community is minority, and minority officers comprise 31 percent of the force. Two years ago we only processed 84 applications for people seeking a job with the Columbia PD. This past year there were over 1,200. We are very proud of that. “We are seeing results and the training is helping. Our latest figures show over 168,000 citizen encounters and 7,000 arrests, with only 108 use of force incidents and officers discharged their weapons three times. The agency participates in a critical incident debriefing program called LEAP—a law enforcement assistance program. The Department has been out in front on other officer wellness programs, too. The agency buys memberships for their officers to local gyms and has hired a trainer to work with any officer who wants to get in better shape. This story originally appeared in the March 2016 issue of American Police Beat. VIDEO: Is This for Real?